Fonduta, is as its name implies, a Fontina cheese dish from northern Italy, especially the Piedmont and Val d'Aosta regions. It is typically served as part of an antipasto with cubes of toasted bread and a glass of wine. Watch Mary Ann Esposito make Fonduta at CiaoItalia.com! Combine the cheese and milk in a medium size saucepan and allow to sit off the heat for 2 hours. Add the butter to the milk and cheese mixture. Cook the mixture over medium low heat, stirring with a whisk until the cheese is smooth. Raise the heat to medium high and whisking constantly, add the egg yolks, one at a time, making sure that each is well incorporated before adding another. The mixture should be very creamy. 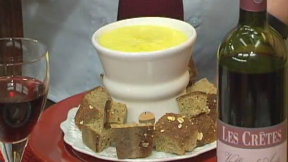 Pour the fonduta out into individual dishes and surround with cubes of toasted bread. This is also excellent served with cubes of fried polenta instead of bread. Soft cheeses like Fontina are best cut with a serrated tomato knife, also called an angel food cake knife.